Maize makes high quality silage for dairy cattle, beef and sheep at less cost than silage made from grass. Research has shown that maize silage in the diet of dairy cows increases forage intake, milk yield and milk protein content. Supplementation with concentrates can be reduced and profitability is improved. New varieties have increased the opportunities to grow this crop successfully in more and more areas of the UK and the area grown increased dramatically through the 1990s and by 2007 was approaching 150,000 ha. Correct manuring is vital to the success of the crop because it greatly influences not only the yield and of the crop and its nutritional content but also growing costs. Growing maize is attractive because it offers a good opportunity for the use of slurry; 80-90% of all maize crops receive manure of some kind. Frequently the nutrient contribution of slurry and manure is not taken into account when determining the amount of fertiliser to apply. It is also important not to exceed environmental guidelines for organic manure application. Soils receiving regular large amounts of slurry should be sampled and analysed periodically to ensure that appropriate levels of readily available plant nutrients, especially phosphate, are not being exceeded. 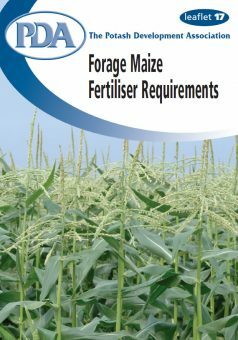 This leaflet explains the principles of fertilisation and provides the most up to date recommendations for forage maize. Average yields are around 40 tonnes/hectare fresh weight with typical dry matter (DM) of 30%. This equates to a DM yield of 12 t/ha. Growers on favourable sites can achieve fresh yields of well over 60 t/ha. 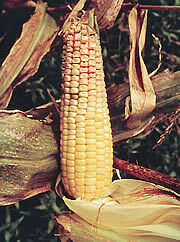 The feeding value of the cob portion is almost double that of the rest of the plant. At harvest, the cobs should form at least 50% of the crop dry matter to give a high quality feed. Maize silage is commonly used to provide up to 75% of total forage in the diet and on this basis, 1ha of maize can provide for 6-10 cows depending upon yield. The protein content is lower than required for most livestock so protein supplementation with rumen digestible protein (RDP) is necessary. Maize is very sensitive to temperature and a favourable site is the key to success. Most areas of England and Wales are suitable provided that the site is below 400 feet in altitude. South facing sheltered sites are best. The soil should be free-draining, have good reserves of moisture and be without compaction problems unless these can be remedied by subsoiling. Friable, well-structured soils allow the preparation of good seedbeds and easy rooting. Heavy soils are disadvantaged by the problems of obtaining a good seedbed in spring and the possibility of harvesting difficulties in a wet autumn. Shallow and gravelly soils run the risk of poor crops in dry years. Maize is such a useful crop that it is not worth taking risks by growing it on drought-susceptible soils. To produce a good crop, maize plants need to grow very rapidly once they have germinated. They will do this if the soil moisture and structure are good, the temperature is warm and nutrition is adequate. 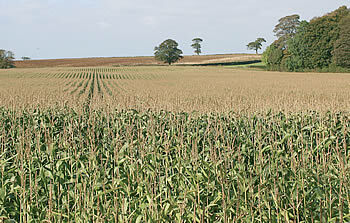 Maize can easily produce 50 t/ha in a period of four months. To support this rapid growth it has a large demand for nutrients and any shortage will restrict early growth and final yield. Although established crops have a well developed root system, root growth is slow in the early days of the crop, especially if the weather is cold. Poor root growth means decreased uptake of nutrients and this can be a vicious circle as poor uptake of N and P can restrict root growth. For this reason experiments have shown that maize, like many vegetable crops, benefits from some N and P fertiliser placed close to the seed, even when the bulk of the soil is adequately supplied with nutrients. Nitrogen (N) is the key nutrient for obtaining maximum yield and quality, but also the one most difficult to get the amount available to the crop just right to achieve optimum yields. This is because the amount of fertiliser N to apply should supplement the amount that becomes available during the growing season from the mineralisation of soil organic matter. Nitrogen encourages leaf growth and an inadequate supply means smaller leaves, reduced photosynthesis producing less starch for storage in the grain, and less total yield and protein. If the nitrogen supply is too large, then there will be excessive leaf growth increasing the proportion of leaf and stem to grain at harvest. Thus the starch content of the silage will be reduced and yields may also suffer. Too much nitrogen may also delay maturity and result in lodged crops. The average maize crop yielding 40 t/ha removes 160 kg N/ha although peak uptake is 210 kg N/ha. Phosphorus (P) is required particularly by the growing tips of the plant, hence its importance for root growth. Any shortage, especially in the very early stages, reduces root growth and nutrient uptake and this can adversely affect the growth of the crop for the rest of the season. Typical phosphate removal is 1.4 kg P2O5/t fresh crop – that is 55 kg/ha P2O5 for an average 40 t/ha forage crop. Typical symptoms of P deficiency (illustrated) are reddening or purpling of older leaves. These are often seen when conditions in the early part of the growing season are cold and wet and growth is inhibited and by soil structure problems that limit the availability of soil P for root uptake. Potash (Potassium, K) is the nutrient required in the greatest amount by maize. An average 40 t/ha crop takes up around 360 kg/ha K2O by early August. The demand for potash is particularly large in the period of rapid growth and the crop needs to take up about 8 kg/ha K2O per day. The soil must be able to supply both the total demand of 360 kg/ha and the daily requirement of 8 kg/ha without any hindrance. This requires an adequate level of readily plant available soil potassium. During maximum periods of growth the maize plant will contain more K than N.
Maize crops also remove large amounts of potash, typically 4.4 kg K2O/t fresh yield which amounts to 175 kg/ha for a 40 t/ha crop. This quantity must be replaced to maintain soil fertility. Nutrient offtake is dependent on yield; a 30 t/ha removes 130 kg K2O and a 50 t/ha crop removes 220 kg/ha K2O. Potassium has a number of diverse roles in plants. It plays an important role in regulating the water content of the plant and with an adequate supply of K plants can survive drought stress more easily. It is essential for the transport of sugar from the leaves to the storage organs where the sugar is converted to starch. It plays a major role in maintaining the turgor (i.e. rigidity) of plant tissue. Leaves need to be turgid to remain fully extended to maximise the surface exposed to sunlight that provides the energy to convert carbon dioxide in the atmosphere to sugars in the leaves. Plants well supplied with K also seem to be less susceptible to fungal and pest attacks. 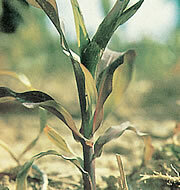 Poor cob fill resulting from K deficiency is illustrated. Magnesium (Mg) is an essential element in chlorophyll and hence for photosynthesis. Crop removal is 40 kg/ha MgO. The total requirement (to be supplied from manure and fertiliser) should be related to Mg level in the soil and additional Mg is only justified at soil Index 0 when 50-100 kg MgO/ha should be applied every 3-4 years. If both potash and magnesium soil levels are below the optimum then apply the larger amount (100 kg MgO/ha). 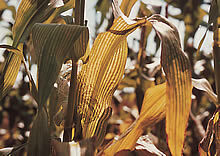 The picture illustrates typical magnesium deficiency symptoms of browning/reddening of the leaf tips and margins and pronounced yellow striping of the leaf veins. Sulphur (S) is a constituent of protein together with nitrogen. Few maize experiments have tested the need for sulphur but deficiencies are possible in areas where the soil sulphur level is below optimum. Sulphur is applied in animal manures, but much of this is unavailable. Trace Elements. Maize is not very sensitive to trace element deficiencies, but boron, copper, zinc, manganese and iron may occasionally be deficient on soils where manure is not applied regularly. The aim when sowing maize is to achieve quick germination and rapid unhindered early growth. The seedbed should be prepared with this in mind. If there is any soil compaction below plough depth the field should be subsoiled when conditions are suitable. Maize fields will normally be ploughed followed by seedbed preparation leaving a reasonably fine surface tilth at least 7.5 cm deep. Below this the soil should be firm but open, preservation of moisture in the seedbed is important. Seed should be sown on to a firm base at 4-6 cm depth, shallower depths are preferred unless the soil is dry. Sow when the soil temperature reaches 8-10°C, usually the third week in April to early May. Too early sowing will hinder germination and establishment and set back the crop, too late will miss a few days of growth and may result in lower yields. As maize is a valuable crop with a high demand for nutrients it is important to know the soil pH and available nutrient levels in order to apply the necessary lime and fertiliser to ensure good crops. When the maize field has been chosen a soil sample should be taken for analysis unless the field has been tested within the last 3 years. (See PDA leaflet 24: ‘Soil Analysis’ for guidelines on soil sampling). Maize needs a pH of 5.8 – 7.0. The field should be limed if the pH is 6.0 or lower. If the soil magnesium index is 0 or 1 the use of magnesian limestone should be considered. For a crop such as maize, which has a high demand for K, it is important to maintain soil K at not lower than Index 2- (121-180 mg K/litre) on fields on which maize is grown regularly. Maintaining this level of K is particularly important because at this level the soil can meet the large demand of the crop for K. To maintain this level of soil K, potash should be applied in amounts equal to the removal in the harvested crop to maintain soil fertility. If soil levels are lower than this, extra potash is needed to build up reserves and to make sure there is sufficient for the crop. If soil K levels are very much higher than 180 mg/litre then potash applications can be reduced but care should to taken to ensure that levels do not fall much below 180 mg K/litre. It is difficult to build up soil K levels on sandy soils and adequate amounts of K in manure or fertiliser should be applied for each crop. The amount of K2O that should be applied is related to the soil K level as shown below. This is the total to be supplied from manures and fertilisers. The target index for soil phosphorus is Index 2 (16-25 mg P/litre). Large amounts of P are often applied with slurry and consequently fertiliser P applications should be adjusted to allow for this input. Maize removes around 1.4 kg of P2O5 per tonne of silage and this amount should be replaced to maintain the soil P Index at about 2. At lower levels of fertility additional quantities of phosphate are required to improve soil P status whilst with higher fertility there are opportunities for savings. In fact it is important that applications of P in fertiliser and manure should be reduced at higher soil P levels and omitted when soil P is unnecessarily high, i.e P index 4 or above. Maize has a very high demand for nutrients during its early growth and normally appears to benefit from phosphate placed close to the seed as a “starter” dose regardless of soil P level. Placing nitrogen is also usually beneficial and there is an added benefit from N and P placed together. The fertiliser should be placed 5 cm to the side of the seed row at a depth of 4 cm. It should not be combine drilled because of the risk of damage to the developing roots from high ‘salt’ concentrations in the soil solution. A starter dose of N and P can be provided by a suitable N:P compound fertiliser. Diammonium phosphate (DAP) 18% N + 46% P2O5 is one such suitable compound but should NOT be used on soils containing free lime as there is a risk that volatilised ammonia gas can damage roots. Triple superphosphate (TSP) 46% P2O5 should be used on used on soils containing free lime. If a starter application is not made, that phosphate should be included with the main dressing. The average maize crop removes 160 kg/ha of nitrogen. The nitrogen taken up by the crop is made up of nitrogen from the soil reserves and nitrogen from the fertiliser and manure applied. The amount available from the soil is termed the ‘Soil N Supply’ and this should be used as the basis for manure and fertiliser use. Because maize is very efficient at extracting nitrogen from the soil, experiments in the UK have rarely shown the need apply more than 100 kg N/ha as fertiliser. It is important to estimate the fertiliser nitrogen requirement as closely as possible. Too little will reduce yield and quality, too much will delay maturity and increase the risk of lodging. An estimate of nitrogen supply is available from the Maize Growers Association from their web site given at the end of this leaflet. The nitrogen available from the soil depends on residues in the soil from previous crops and previous fertiliser and manure applications. The Soil N Supply can be estimated by using a scheme adapted from one used for grassland in MAFF book ‘Fertiliser Recommendations RB209 7th edition’. Note: Nitrogen inputs refer to use on previous crop and include manure nitrogen. * It is unlikely that forage maize will be grown on soils with ‘low’ Soil N Supply, as defined in the previous table. Placement of some starter nitrogen is usually beneficial as discussed above for phosphate, and there is added benefit from N and P placed together. DEDUCT the nitrogen applied as starter fertiliser from the above recommendations for the main application. Forage maize is a very convenient crop on which to apply manure or slurry in the spring when there are limited opportunities for spreading on grassland. In the past, heavy applications have often been applied to arable land before sowing maize. Such applications may be counter-productive because they can decrease yield and quality. Applications should not exceed 250 kg/ha of total nitrogen to conform with the Code of Good Agricultural Practice and NVZ requirements. Be careful that regular applications of manure (or fertiliser) do not increase soil P or K levels beyond Index 3. The uncertainty of nutrient provision from manures requires the regular use of soil analysis to monitor the effects on soil fertility – sample every 4-5 years. Where manure is transferred to maize ground away from another crop (e.g. grass silage) adequate nutrient adjustments to fertiliser policy must be made for the other crop. The available nutrients in manure or slurry can be very variable. The table below, derived from ‘Fertiliser Recommendations RB209, 7th edition’ and PDA leaflet ‘Nutrient Content of Manures’ can be used to estimate available nutrient content. More accurate information can be obtained by having the manure or slurry analysed if it is possible to take a representative sample. Manure applied before February may only have half the available nitrogen of a spring application. The importance of placed starter N:P fertiliser has already been discussed. Other fertiliser is best worked into the seedbed. Where large quantities of fertiliser potash are required some should be applied the previous autumn so that no more than 100 kg/ha are applied in the seedbed. Some of the nitrogen application can be delayed for up to 4 weeks after sowing. Applying one third of the nitrogen after crop emergence has given good results in trials and is especially beneficial in wet years. Any nitrogen applied after the crop is growing should be placed on the soil between the rows using adapters especially made for fertilising maize to avoid scorching the crop.